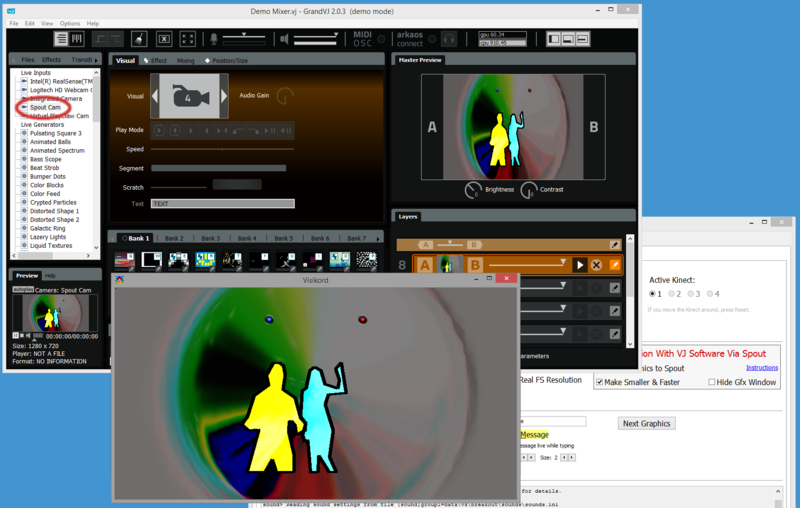 Visikord version v2.9.8 has a new feature made for pro VJs — it supports integration with GrandVJ, Resolume, VirtualDJ and other VJing software via Spout. Spout is a free software library for graphics exchange between applications. With Spout installed, all you need to do is check “Send Graphics to Spout” option in Visikord and select “Spout Cam” as the live source in your VJing software. Now you can projection map the visikord image with live dancers’ visuals or do any other post-processing. Big thanks to Kris Kaeser of the Infected Visuals crew for help! Spout download is on the front page of spout.zeal.co. Current install is SpoutSetup_V2.003-beta.zip. When installing, make sure to enable DirectX9 and Spout Cam installation. 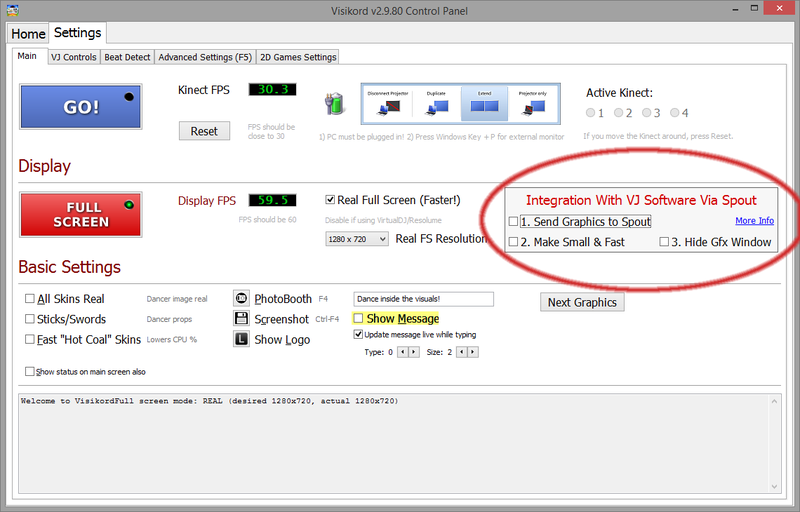 This option reduces the size of the Visikord texture in order to keep Visikord frame rate at 60. 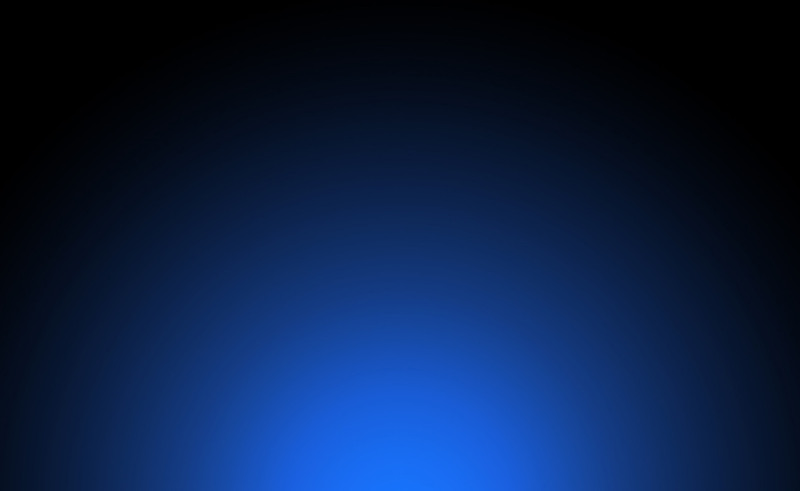 If you never activated before, it may take a few seconds to detach the “full screen” mode that works best when Visikord is the only video output. i.e. change to your desired dimensions, but please note that some window sizes may confuse the VJing software (which is why manual resize is disabled). “SpoutReceiver” as a plugin is the cleanest way to receive Visikord Spout output where supported. 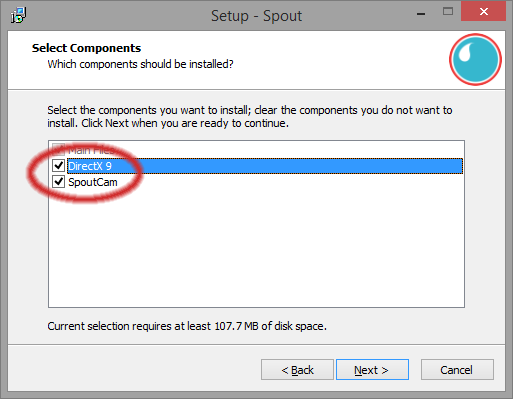 “SpoutCam” is a virtual camera created on Spout installation that is available where Spout Receiver plugin is not supported. On first time use, copy file “c:\Program Files (x86)\Spout2\FFGL\SpoutReceiver2.dll” from your Spout 2 installation to “plugins\vfx” folder of your Resolume installation e.g. 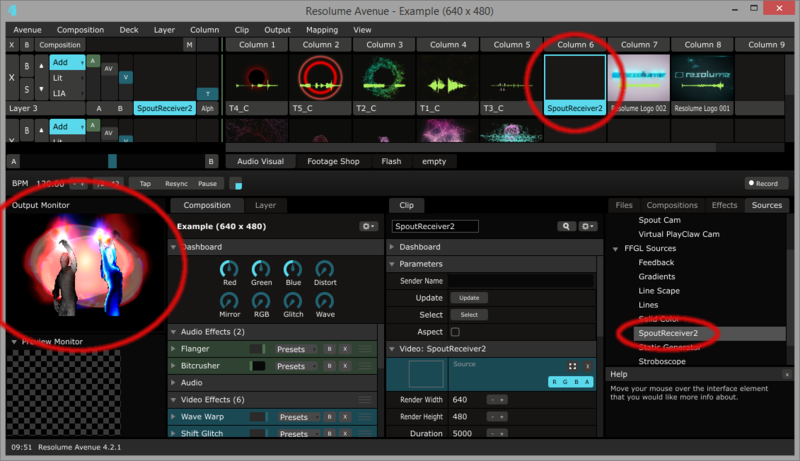 “c:\Program Files (x86)\Resolume Avenue 4.2.1\plugins\vfx” and restart Resolume. Afterwards select Sources -> FFGL Sources -> SpoutReceiver2 as the source and Visikord will appear in it. These applications support Spout Receiver as a plugin. Please check Spout installation for instructions how to enable it. Once you have verified everything is OK, hide Visikord graphics to reduce on-screen clutter. You will still have the Visikord GUI window available for control. If the Spout Cam in your VJ software shows “static”, which happens when you include Spout Cam before you enabled Spout streaming in Visikord, simply disconnect/delete the channel with the camera and put it back — that will show the live Visikord image back in its place. That is all there is to it. The email update with the link to the new version is on its way to our current users, and new users are welcome to download the latest Trial version and give it a go. Happy VJing!